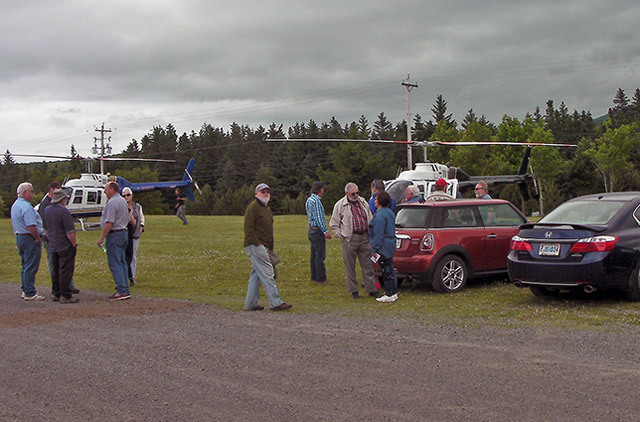 Northeast Margaree, NS – Port Hawkesbury Paper, LP (PHP) representatives came to Margaree on July 24, 2017 at the request of the Margaree Salmon Association (MSA). MSA hosted the meeting at its office in the Cranton Crossroads Community Centre. The Margaree Salmon Association has been active in monitoring cutting in the highlands this year. On July 4, 2017, several Directors and officers took a helicopter fly-over tour above Forest Glenn Brook, among other highland areas. Port Hawkesbury Paper, LP, provided the tour and the flight. The Association learned that the Mill is licensed to carry out forestry operations on 22% of the Margaree River watershed. During the next four years about 3,662 hectares is planned to be cut, or about 3%. 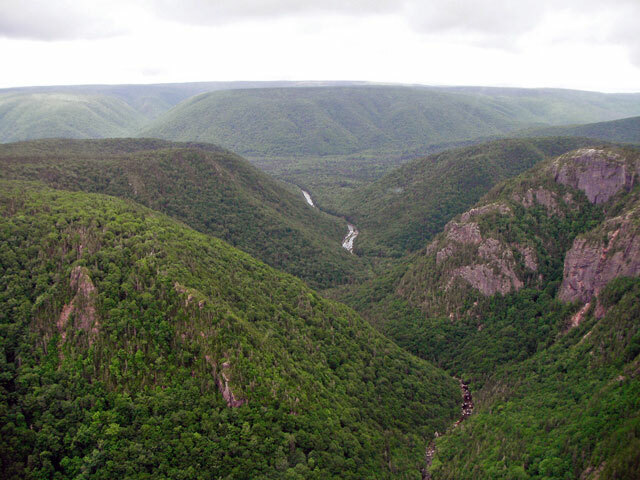 The cuts above Belle Cote will be in 50-hectare sections separated by forested buffer zones. Director Greg Lovely was particularly impressed with a new initiative by the Mill to fund monitoring of water levels and flows that may impact river levels and watershed drainage. Department of the Environment performs operation audits to make sure that companies hired by the Mill are following proper procedures. The Association continues to monitor activities in the Margaree River Watershed, working closely with all stakeholders. 2. Margaree highlands watershed: steep slope protection. Photo: G. Lovely. Click here to download a PDF version of the MSA press release.